Behold the room that makes life here possible! (I shot the image below in the late afternoon while testing the Pentax K-x’s in-camera high dynamic range processing and then tweaked it a bit more.) I hope your home has a space like this that’s warm, where you can eat, sit, have a drink, or dry your clothes in the winter. My wife isn’t into the latter capability at the moment and would probably trade my bones or this house for a gas dryer—nonetheless, if the deal goes down, we know how to do the laundry. Most importantly though, the walls are solid, the roof doesn’t leak (except for the infrequent downpour or a heavy snow melt), and with the wood stove cranking away just out of the picture to the left, the room we call the “saloon” is always warm and cozy—sometimes even too hot, like this evening! (Achieving “too hot” while the outside temperature drops to single digits is accomplishing something, all right, and I had to open a window for an hour or so.) That’s an actual bar—no plumbing—in the gloom on the left. There’s a nice light with a big glass shade hanging over it, and during the cold months, we usually eat sitting at the bar with the stove blazing less than 10 feet away. The 18-inch thick solid adobe interior walls soak up a lot of heat while the stove is going. In the morning when my wife gets up before dawn, the saloon is still a pleasant place to sit and read the paper with the cat on her lap. When I finally stumble out of bed, I reload the Ashley, and the 24-hour cycle begins anew. As I write this, I realize that I’m the heating system. She can handle a wood stove, but this is an antique ASHLEY with half a dozen serious quirks, a manly countercultural icon from the Whole Earth Catalog back-to-the-land days, and I work with nuclear pitchwood much of the time. In my firemaking zeal, I have dug my own grave! It’s almost worse than having a cow. But did you notice the rest? The doorway into the kitchen, for example, was originally a window. Our late landlord simply scraped away enough adobe below the window frame to make an arty doorway and then plastered the lot. Beyond that is a shoebox kitchen with a concrete floor that was added on later. The gray rug in front looks lumpy because it is: underneath that is a solid, hand-smoothed mud floor laid down right on top of the ground. There’s nothing under that but God’s own very solid dirt, with nary a creak or bounce. There’s a skylight you can’t see above the coffee table, and a comfy chair you can’t see, either, off to the right. The red sofa’s okay and goes with the place (more I dare not say). You don’t need much to get along in this world, really. A fire, good walls, and a roof will cover most of it. Sometimes I feel like a beetle under a rock, but unless someone kicks it away, the boy is safe and sound. That room is like ‘comfort food’. That piece was a beaut, especially the concluding paragraph. These landlords of yours do their work to perfection, then die off just for the sake of leaving you in full possession of paradise. That’s the way a landlord or any other kind of Lord ought to act. I don’t know that I’d quite go with “perfection” or “paradise,” much less “full possession,” but on the other hand, I’m here and I’m warm. 🙂 And ol’ Dale was a super landlord. 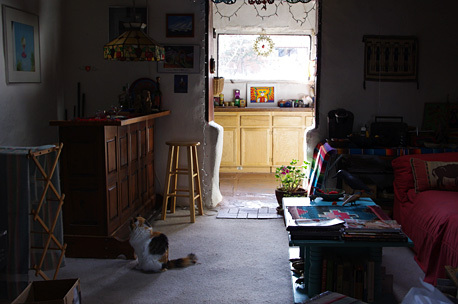 He lived in a tiny studio apartment tacked onto the end of our adobe—which he originally upgraded and lived in until deciding to build a little space for himself, so he could rent the larger one out and get some income. You can read about the last time I ever saw him here. There’s a lot of material on him at FarrFeed.